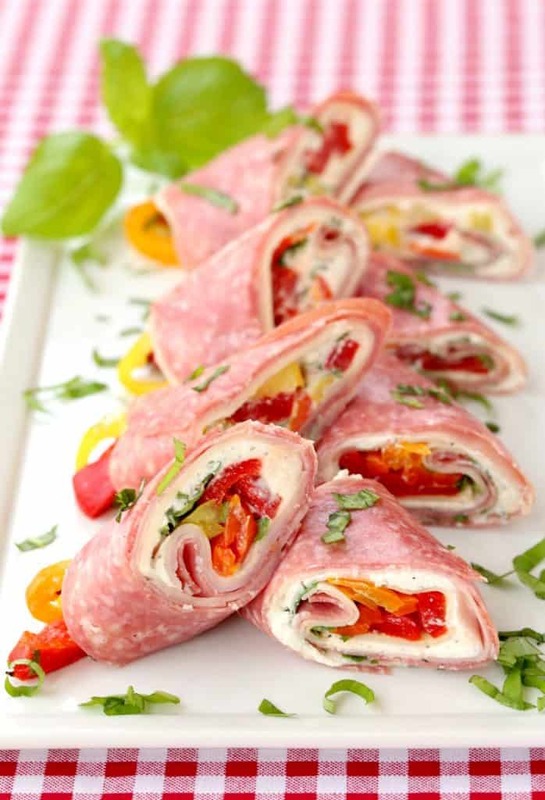 Try these Italian Deli Roll Ups for a low carb snack, lunch or dinner idea! This easy low carb recipe is also perfect to serve for happy hour or at parties! Low carb lunch ideas like Spaghetti Squash Stir Fry, Zero Cream Asparagus Leek Soup, or our famous Naked Sheet Pan Tacos are always a hit! I’m not a huge sub sandwich fan but when I do get one, I always go for an Italian sub. I love the flavors of all the different meats and cheeses combined with olive oil, salt and pepper. But the bread has to be just right. It seems like so many people (including myself) are looking for high protein low carb recipes these days…so I aim to please. We eat some pretty good food around my house, pretty much all the time so adding a few low carb dinner recipes to the mix is never a bad idea! We’ve made a few lower carb recipes on the site here now, one of my favorites are these Low Carb Hamburger Cheese Crisps and a long time favorite are these Buffalo Chicken Celery Sticks. 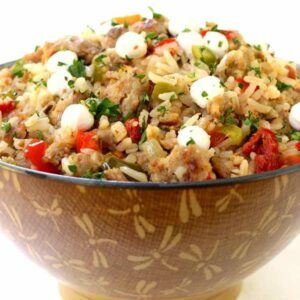 Also we’ve got a whole collection of Low Carb Dinner Recipes that will give you a few low carb lunch ideas too! We’re trying here guys…we’re really trying! 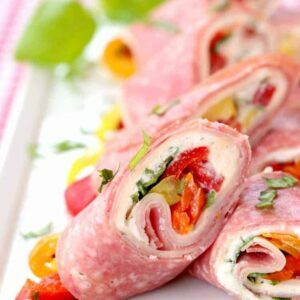 This low carb lunch idea is still going to give you all the flavor of your favorite Italian sub sandwich, without all the extra carbs. 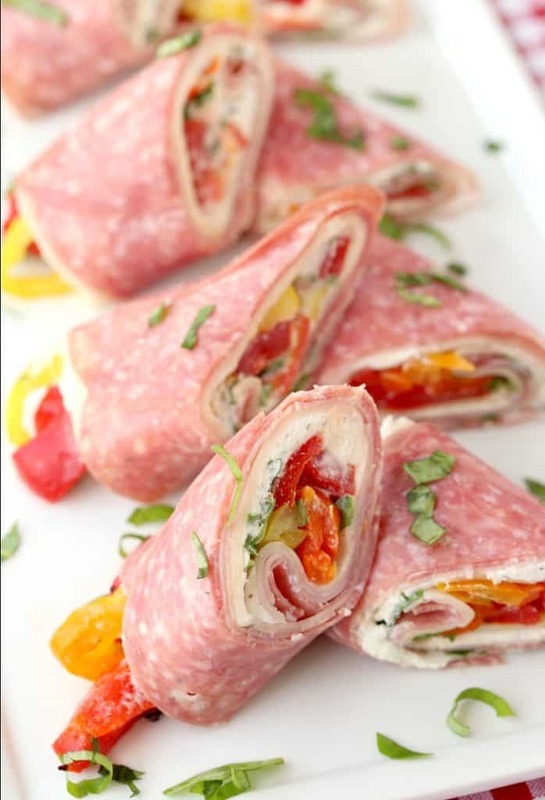 I added a thin layer of seasoned ricotta cheese to these roll ups because I love the flavor of the ricotta. Also it gives you a different texture than just the meat. Yes, there are a few carbs in ricotta cheese – I know it, but not many. Just check out the nutritional information in the recipe card! And of course, there’s way less than a sub roll so let’s not worry too much about that. 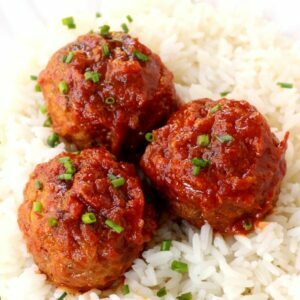 You can totally switch up the ingredients in this low carb recipe with your favorite deli meat, these are just mine and the flavors go really well together. Hands down as good as getting a giant Italian sub from the deli in my opinion. 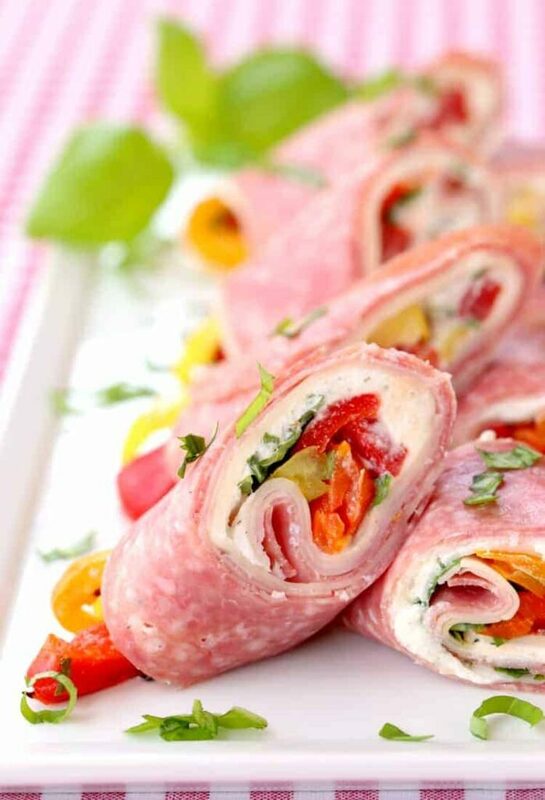 Try this low carb recipe for lunch, dinner or appetizers! These are going to go perfectly cut up on that happy hour cheese board! 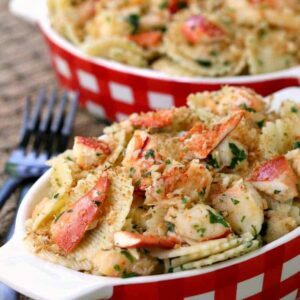 What Ingredients Can You Substitute In This Recipe? • Shredded lettuce or arugula instead of fresh basil for extra crunch! This fun low carb snack or appetizer can be served any time of the day! 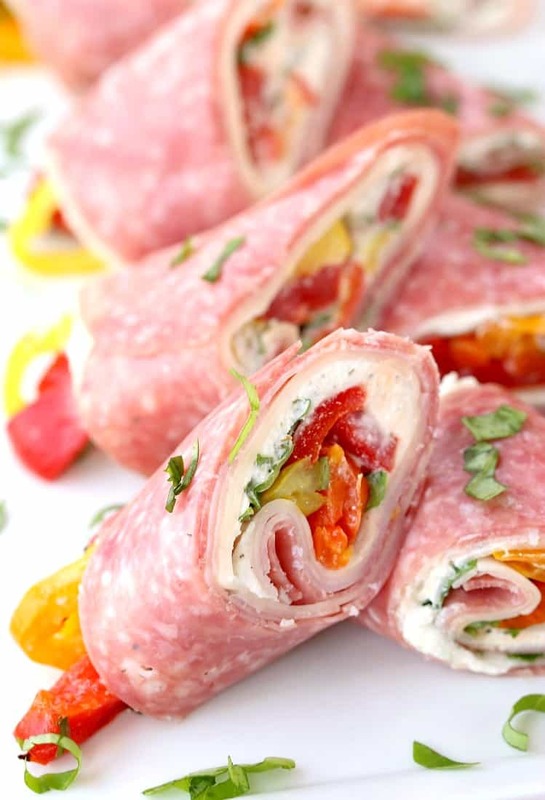 You can easily customize the flavors in this appetizer recipe to your liking! Make the ricotta filling by mixing the ricotta cheese with the italian seasoning, garlic powder, salt and pepper together in a bowl. On a cutting board, lay out 3 slices of salami so that the edges overlap each other. Lay 2 slices of ham on top of the salami followed by 2 slices of provolone cheese. 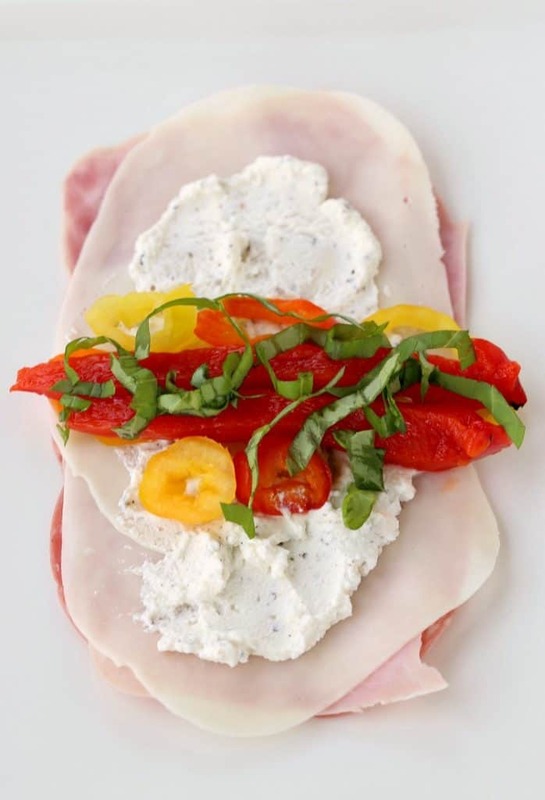 Spread a thin layer of the ricotta cheese on top of the provolone. Add 2 thin strips of red peppers and 5 or 6 banana peppers making a line across the center of the roll up. Add 1 teaspoon of the chopped basil on top of the peppers. Roll up the wrap ending with the seam side down. Cut on a diagonal in half and repeat with the other roll ups. Oh em gee. I had to stop and look at this recipe from Pinterest. Those are my favorite subs as well, and I agree it has to be just right. While I also loooooove bread and butter I will definitely give these a try!! Not much beats good ol’ bread and butter! These help though! I rolled these up in a piece of parchment paper, kinda like rolling sushi, and then sliced them. Made it so nice for my guests to pick up. I used the arugula instead of basil, how much did I love that crunchy peppery addition? Thanks for a great recipe. We LOVE arugula, I’m definitely doing that next time! Thanks for checking in with us Lori!